Fleas are annoying pests that bite our pets (and us in some cases), feeding on blood. They carry diseases and the saliva in their bites often leads to a cat flea allergy symptoms developing. An allergy to flea bites causes Flea Allergy Dermatitis (FAD). This is a fancy term for the skin problems resulting from the allergic reaction to flea saliva. Cats, dogs, and humans can all react, but the way it shows up on the skin looks different. The hallmark in all of them is that it creates a very itchy cat or dog. FAD is the most common skin disease in pets in the world. Don’t assume your cat can’t have fleas because you live in a high-rise apartment and your kitty has never touched a paw on grass. Fleas have a way of hitchhiking on humans to reach your kitty inside. Anyone can have fleas in their home! It is estimated that up to 50% of the cats with fleas will develop a cat flea allergy. If cats are not allergic, they may only scratch slightly even if they have many fleas. The amount of scratching does not indicate how many fleas a cat has. If the cat is allergic, one flea bite can cause enough itchiness to make the cat scratch constantly. The most common cat allergy symptoms are intense itching, scratching, and/or licking. These cats will scratch and lick themselves excessively. Some cats seem to prefer to do it in private, though, and you won’t see them doing it. Because of the excessive grooming, they may have more hairballs than usual. Cat flea allergy is the most common cause for itchiness, scaling, and crusting sores on cats. However, many other conditions can cause similar looking skin problems. Flea allergy dermatitis can also appear in different ways on the skin and none is specific just to FAD. The most common presentation of cat flea allergy is called miliary dermatitis. These are small crusty bumps on the skin. They are most common on the back and neck, but may be in other areas as well. The bumps tend to be small and you feel them easier than you see them. If the cat is scratching at them a lot, they can become infected or get larger. However, infection is not common in cats. Some cats just appear to be losing fur and have thin or bald areas. There may also be sores on the skin, but not always. They can also occur on the upper lip, sometimes just on one side. This form is often not itchy or painful. Lesions can also be inside the mouth. The condition can also cause a swollen lower lip or chin that also doesn’t seem to bother the cat. 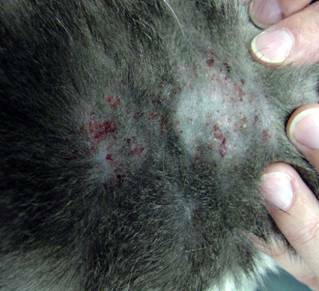 Although miliary dermatitis is the most common skin reaction seen in cats with flea bite allergies, any of these presentations can occur. Other conditions can also cause all of these same skin reactions. This means you can’t look at the skin and say, “Your cat has a flea allergy!”. FAD is just one possibility. 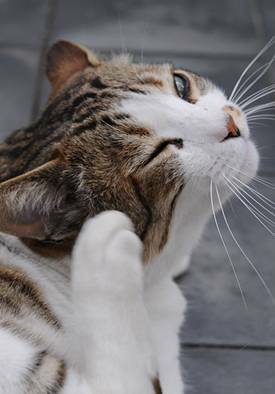 Diagnosing cat flea allergy is easier if you find fleas or flea dirt, but, too often, you don’t find them on an allergic cat. The cat is grooming them off so rapidly, you don’t find any evidence. The diagnosis may be made by seeing how the cat responds to appropriate treatment. Often the biggest challenge veterinarians have is convincing the cat parent that fleas can be the problem. Fleas aren’t seen so it’s difficult to believe they are there. Just one flea can cause intense itching for up to 3 months. 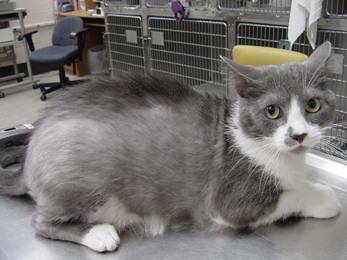 The cat parent may also be treating the cat for fleas, however, not all flea prevention works 100%, and they kill the flea in different ways. Some repel, some kill on contact, and some the flea must bite. To complicate things further, your cat may have other allergies or conditions that also cause itchy skin. In these cases, you may need to treat for fleas and see how much relief your cat has. If you still have an itchy cat, you will need to look for other causes. The mainstay of cat flea allergy treatment is to control fleas well. You need to treat for three months to get fleas completely under control and to stop the allergic reactions. You should use one of the newer flea products that are more effective. 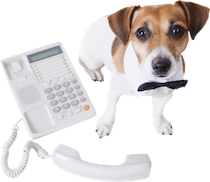 Treat all pets in the house and treat the house to reduce the number of immature stages. Your veterinarian can give you medicine to help your cat be more comfortable while you are working on the fleas. Having a cat flea allergy problem will surely make your kitty miserable. Because it can be difficult to diagnose, you should assume every itchy cat has fleas and treat them appropriately. On the one hand, once you get rid of the fleas, the problem is solved. However, on the other hand, it’s a lot of work, time, and expense to get rid of the fleas. 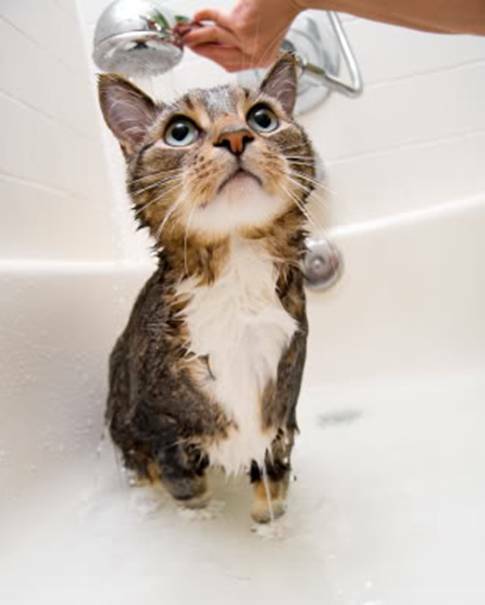 Keep at it so you get the fleas under control as quickly as possible so your cat is comfortable. Then continue treating your cat year-round so that he never has to go through it again.